Preheat oven to 400ºF, with a rack in the center. In a small bowl, stir brown sugar, olive oil, soy sauce, lemon juice and white wine until the sugar has dissolved. 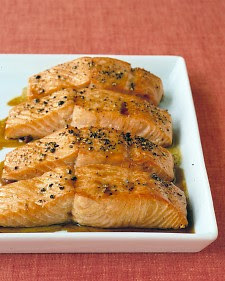 Cut salmon fillet into 4 equal-size pieces; arrange, skin side down, in a single layer in a baking dish. Pour glaze over the fish, and turn to coat evenly. Bake until fish is opaque but still bright pink inside, basting every few minutes with glaze from baking dish, 15 to 20 minutes. Serve with lemon wedges.